It won't be long now until we start seeing industry predictions for 2014, and with the arrival of the Xbox One and PlayStation 4, it's fair to assume that it'll be a massive year for gaming. Yet, while the next-gen consoles will hog the limelight this holiday season, it could well be the PC that takes the driving seat. Valve's Steam Machine is the latest attempt to bring high-end PC hardware into the living room, but over the course of the next few months, we can also expect to see a new wave of hardware aimed at self-builders who are eyeing-up a small-form-factor (SFF) gaming rig. Getting the ball rolling is none other than EVGA, who having become synonymous with enthusiast-orientated graphics cards and motherboards, is now trying its hand at chassis design with the Hadron Air. Don't be surprised. Since the launch of the GeForce GTX Titan back in February, Nvidia has been keen to highlight the suitability of its latest GPUs in small-form-factor machines. As one of Nvidia's key partners - and, of course, a purveyor of high-end mini-ITX motherboards - EVGA is well-positioned to realise the SFF dream. The Hadron Air, priced at £170, is the firm's first effort and claims to be "built for the enthusiast." The premise, in a nutshell, is this: "the EVGA Hadron chassis is extremely small, but capable of holding today's latest hardware." Looking at the wider picture, this is where the PC industry needs to turn its attention. With year-on-year sales being eroded by tablets and laptops, the time has come to look past big, bulky desktops and deliver full-on PC experiences in pint-sized packages. We don't expect to see manufacturers delivering anything as bold as Apple's latest Mac Pro - at least not yet - but one thing's for certain, the average PC is going to get significantly smaller. So how small can you go without giving up gaming-grade performance? Well, for the Hadron Air, EVGA has settled on a chassis that measures 169mm (W) x 305mm (H) x 308mm (D). That's easily small enough to live on top of your desk, alongside your monitor, and the company's designers have done a good job keeping the overall appearance looking suitably sleek. 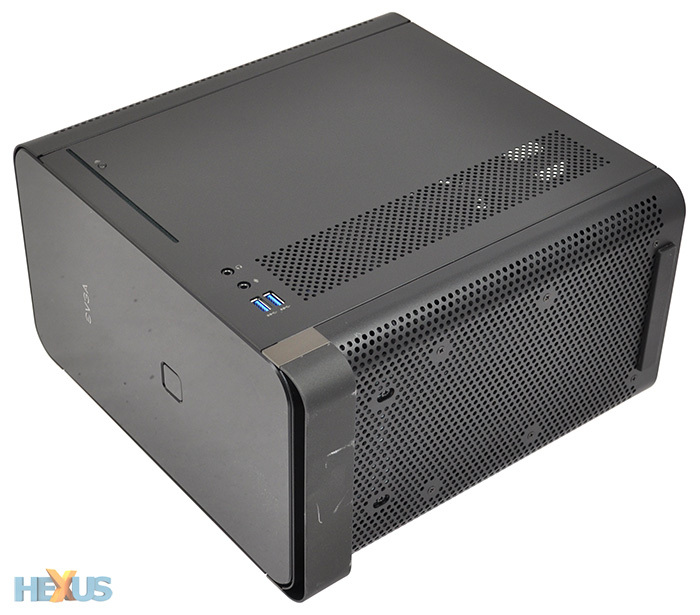 Finished entirely in black and given smooth rounded edges, the Hadron Air looks a little like the BitFenix Prodigy, though EVGA's chassis is noticeably smaller in size. The top and bottom act as full-length perforated vents, and though there are no dust filters, build quality is good throughout. The steel frame feels rigid and well-put together, and it gives the small enclosure a surprising amount of heft - it tips the scales at around 6kg. Hadron Air's front fascia carries a glossy, almost mirror-like finish that's really attractive to begin with but destined to attract dust and fingerprints in the long run, and a small EVGA logo alongside an easy-to-find power button are the only interruptions. There's no reset button and no activity LED, and to maintain the clean aesthetic the I/O ports are tucked neatly around the side. 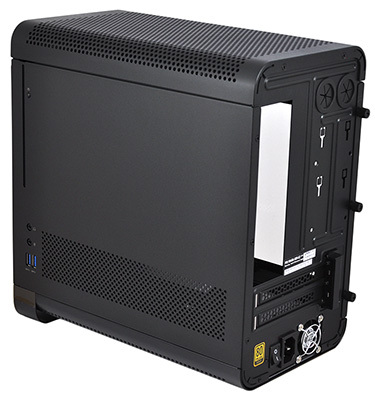 On the right side panel, EVGA has housed dual USB 3.0 ports, audio and microphone jacks, as well as another air vent and a thin opening for a slot-loading optical drive. Finding a drive that aligns perfectly shouldn't be too difficult, but if in doubt, go for EVGA's official recommendation, a Panasonic UJ8C5 DVD writer. Over on the other side, the left panel comes equipped with a large window that does a good job of showing off all your internal components, and this panel is held in place with a trio of thumb screws, making it relatively easy to get inside. The side panels themselves are well-built, but they are notched as opposed to hinged, so getting them aligned is a little trickier than it might have been. There's only so much you can do with a small black box that still has to accommodate today's most extreme graphics cards, but credit where it's due, EVGA's Hadron Air is very easy on the eye. 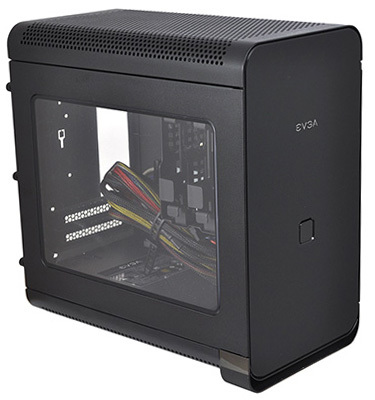 It's stylish for a high-end mini-ITX solution, and we quite like the fact that EVGA has chosen to raise only the front of the chassis off the ground, giving the whole package an interesting slant. On the whole, this is a good-looking and well-built enclosure, but you're probably wondering the same thing we were: given its size, where does the lofty £170 price tag come from? That's a good question. SFF chassis have in the past arrived at a premium, but the Hadron Air is seriously expensive. It costs more than most full-tower solutions and is one of the most pricey mini-ITX enclosures on the market today. It really needed to be a whole lot cheaper, but it's worth noting that some of the cost can be attributed to a couple of bundled components. 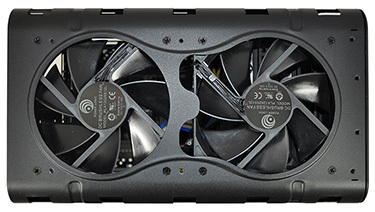 As standard, the Hadron Air comes equipped with dual 120mm exhaust fans (Power Logic PLA12025S12Ls) installed in the roof of the chassis, as well as a 500W 80PLUS Gold-rated power supply installed in the base. 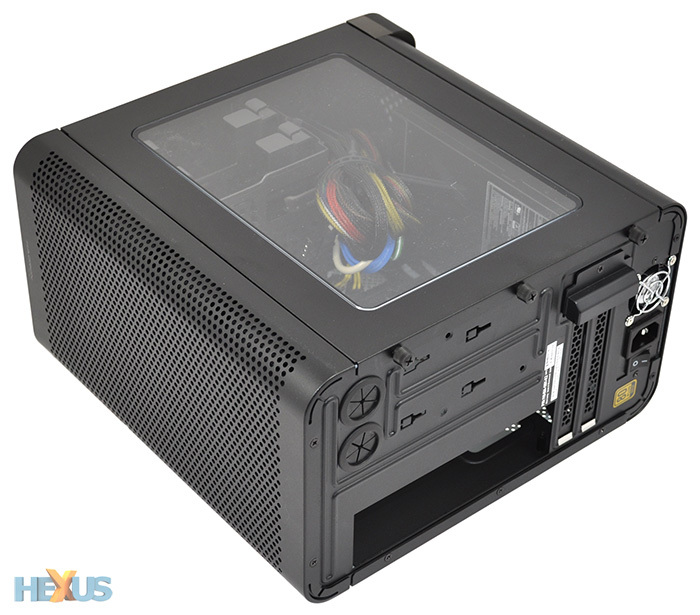 The 1U PSU - identified as an FSP500-501UN- is capable of providing 40A on a +12V rail, and there's ample juice for a high-end build armed with, say, an Intel Haswell processor and GeForce GTX 780 graphics. Connectivity options are plentiful, too. 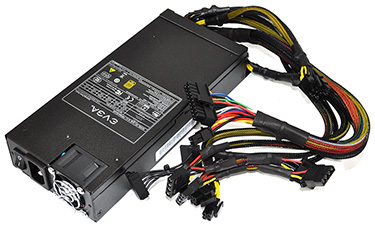 In addition to the usual motherboard connections, the PSU's array of connections includes four Molex power, dual SATA power and dual eight-pin PCIe. Cost, we feel, is going to be the biggest hurdle, and as it stands, the Hadron Air's appeal is limited to enthusiast users who are willing to spend extra in an effort to put together a compact, good-looking and powerful build. Sound like you? Then let's take a look inside.